Perhaps the most anticipated piece of software ever to be unleashed into the world of live looping. Containing all the features of the EDP, the Echoloop puts a whole new world of possibilities under the control of just a few virtual buttons. The only looper specifically designed so taht your music can grow organically as you play and listen, and the only looping device designed with the input of a whole community of creative looping musicians over more than a decade. Run as many as Echoloops you like (synced together). Quality...as good as your audio interface. Number of loops, and max loop time depends only on memory available. Control by Midi, even the simplest foot controller can be used. Donationware, with a price to suit your pocket. "New effects that respond to the music, and inspire the musician." 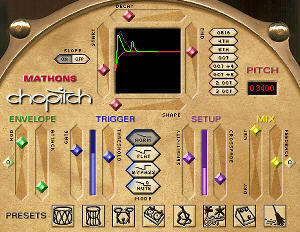 Chopitch 1.1 released, a VST pitch shift plug-in for pc and mac. New feature type in no. of semitones for easy/accurate shifts. An amazing remix tool, unique beat chopping action totally transforms any beat. New sounds from percussion instruments, live and in the studio. Play bass lines on any instrument! 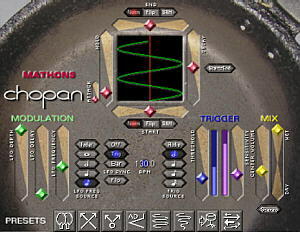 Chopan is the VST autopanner which adds new possibilities to spacial processing. Panning triggered from audio or synced to host BPM. Add motion to beats, put rhythmic sweeps onto pads. Vast range of random and repeating patterns. 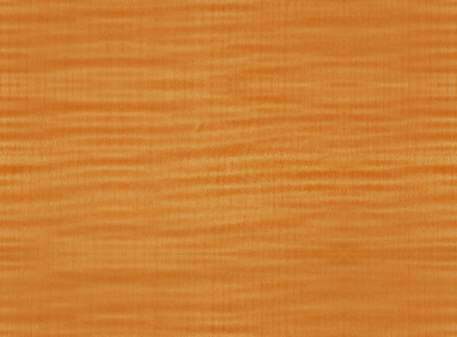 LOOK HERE for info on using our polyphonic plugins for guitars with hexaphonic/divided pickups.